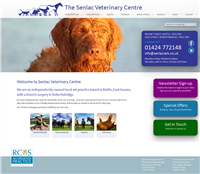 Senlac Veterinary Centre is an independently-owned vet practice based in Battle, East Sussex, with a branch surgery in Robertsbridge. It is a long-established mixed practice that cares for all animals, from cats and dogs, small pets and backyard hens to farm animals and horses. As a business, they pride themselves on a friendly and personal service, and strive to include owners in all they do for their pets. Tektonic Ltd. have designed and built a fully responsive Website to provide a platform for their clients to have easy, clear access to a wealth of information concerning animals, health protection and veterinary services online. A bespoke Content Management System has been created to allow the Website to be kept up-to-date always for clients and so that their online presence can serve as a knowledge base for their customers to complement the practice. 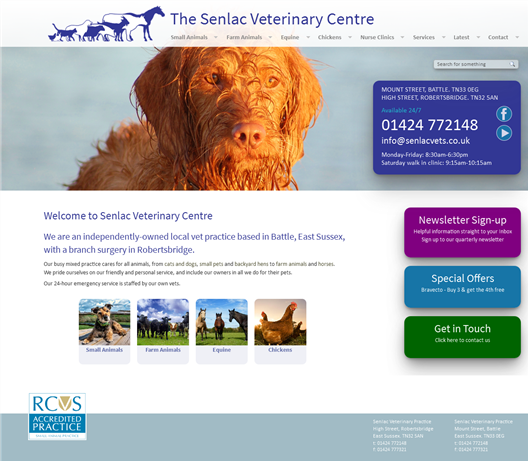 Tektonic Ltd. also design, code and manage the mailing of a quarterly newsletter service for Senlac Veterinary Practice to enable our client to keep their customers informed in all aspects of pet care and health advice. We have been clients of Tektonic for many years and are very happy with the service given. They are very prompt at coming to our rescue and very accommodating in arranging meetings at convenient times to us which, being a very busy Veterinary Practice, is very helpful. I would recommend Tektonic to anybody.